I’ve been away from posting for a while, main because of some serious pregnancy related grumpies but also working on some baby stuff. We bought a baby cradle and I went on a sanding binge so we can paint it. Now I just need to decide how it will be painted so I can actually do it. Just a bit of baby nesting going on I guess. On to the post!! I wanted to share my first Biu Biu purchase with you. On July 4 they annouced a free shipping offer for US customers through their Facebook page. Considering shipping is from Poland, it’s a steal! I’ve wanted to try their stuff for a while, and what better way then to try it with free shipping. The problem was that I wanted something that I could wear now while pregnant, but also after pregnancy. I decided on the Fado in Lazur because the fit and the color. I really wanted the Sines but it wasn’t available at the time I ordered. 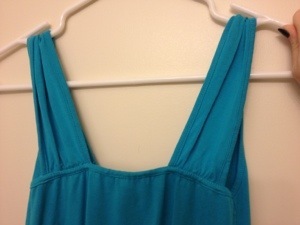 This top is wrap front tank with a low center. 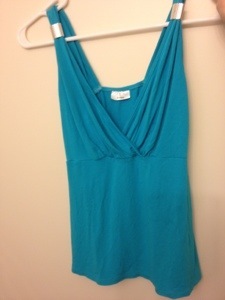 It fits under the bust and is light and flowy through the waist and hips. Perfect for a pregnancy top or a light loose top for summer. At first I did not have a bra with a low enough gore to wear this. Really I still don’t, but I wear it with a bra that I can adjust the wrap front to cover. You will definitely need a plunge style bra to wear this. The material is thin so you’ll want a smoother cup bra as well. I wore a seamed bra, but the bra seams have to be done tightly or they will be visible. A normal three part designed mesh bra will not work for this top. The back is a basic tank design with width of the straps based on the placement of the silver decorative rings. I’m not a huge fan of the rings, but they are easy to move around and place differently. The fabric is 96% viscose (like rayon, light and breathable) and 4% spandex. I thought that would give me a bit of room to stretch in the bust area, another indicator to go ahead and keep the 34BB/BBB size. This photo was taken a few weeks ago. I wore this top to my OB’s office to get my 4D ultrasound done. So in this image I am right around 26.5 weeks pregnant. As you can see the bust portion fits pretty well, but it may be too tight for how some would want it to appear. The portion from the underbust seam and down is nice and loose, easily accommodates my baby bump. From the front you can see the bust size again. I’m a pretty small person normally so I kind of expect a little bit of a disproportionate look when I wear a top that flatters the bust line. I really like this though, I like the shape of the neck line and that you can use the metal (they are really plastic) rings to adjust the thickness of the straps. As you can see it highlights the smallest part of me, which happens to be my underbust right now, and flows over the rest of my belly. It makes me feel like I’ve got a bit of my normal hourglass shape, where my waist is usually the smallest. Again, some may want a looser fit in the top portion, so if you are at the top of the measurements for your size you may want to consider ordering a size up. I’ve been told by many that the Biu Biu customer service, and Kinga the owner, is among the best and will gladly provide personal sizing advice based on your body measurements and your tastes. One more from the side. Please excuse the lines from my maternity shorts in this one. The bunching in the back is from my back curving in more from pregnancy. You can also see the material of the back stretching a bit to accommodate my bust size. In some that may be a bother, but I know that right now I have a changing body and I can’t expect a perfect fit for everything. Wearing this top out really helped me feel better about some of the changes going on in my body. It is similar to something I’d normally wear, but easily works with my body as it changes through pregnancy. I felt more like myself in this top then I have in any maternity styles that I have worn. And for the price, you can’t beat it. This top was $22.25. Amazing when you consider what you could get in a mall for that price. Ordering was a simple process, and payment is very easy through PayPal. I do think next time I may contact the customer service for sizing help as I may normally need smaller then the 34 but larger then the BB/BBB (maybe like a 32BBBB). The designer is very in touch with what products may work for individual sizing needs. The model’s sizes are listed on the website with each garment, so it is easy to see what size they are wearing compared to sizes they wear in other garments. Watch their Facebook page for updates. They are currently on a brief vacation, but the fall lines are coming soon. They have shared some previews of gorgeous designs, some of which have made my want list. Also check out the reviews below for some other blogger’s thoughts on their Biu Biu purchases. Brittnay from Thin and Cuvry. Be sure to check her other posts! This looks like a great summer top! I’ve just got hold of the square necked one from last year (not sure if it had the same name) and I love it but it’s just a little too low cut for comfort so I think I’d like to try this one. Like you, I need smaller than a 34 in some of their items so I’m a bit wary of buying anything I haven’t already seen reviewed. So it’s great to see so many bloggers posting about the clothes!